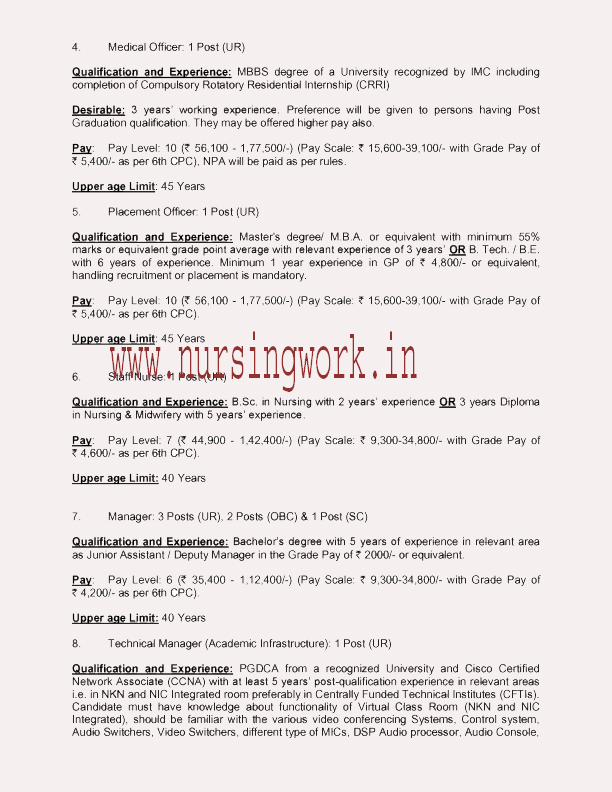 Pay: Pay Level: 7 (` 44,900 - 1,42,400/-) (Pay Scale: ` 9,300-34,800/- with Grade Pay of ` 4,600/- as per 6th CPC). Qualification and Experience: B.Sc. 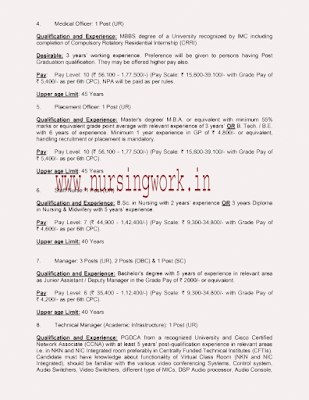 in Nursing with 2 years’ experience OR 3 years Diploma in Nursing & Midwifery with 5 years’ experience. 1. The applicants must apply online through the link provided at institute’s website www.iiti.ac.in till 02-07-2018 (5.00 pm). The printout of the completed application form shall be submitted to the institute along with self-attested copies of required documents on or before 5.00 pm on 09-07-2018. Institute will not be responsible for any postal delay or application lost in transit. Applications not received within the due date shall be rejected. No correspondence in this regard shall be made by the Institute. 2. The applicants are required to pay a non-refundable application fee of ₹ 500/-(Rupees five hundred only) to be paid through online portal. Candidates belonging to SC/ST/PWD communities & women are not required to pay application fee. 3. Application fee once paid shall not be refunded under any circumstances. 4. Candidates who have not acquired the educational qualification (declaration of results) on the closing date of receipt of application shall not apply. 5. Candidates are advised to fill their correct and active e-mail addresses in the online application as all correspondence will be made by the Institute through e-mail only. Test/Interview schedule will be communicated through the e-mail id in due course to the candidates in their registered e-mail. No separate letter (Hard copy) will be sent for this purpose. Further, for any updates, please visit the Institute website regularly, for subsequent amendments in the advertisement and results. 6. The candidates applying for any post should ensure that they fulfill all the eligibility conditions for the post. Their admission to any stage of the selection process will be purely provisional subject to confirmation that they satisfy the prescribed eligibility conditions. Mere issue of registration certificate / call letter to the candidate will not imply that his/her candidature has been found eligible. 7. Age relaxation will be given for SC/ST/OBC/Persons with Disabilities (PWD)/ Ex-Servicemen, Central Government employees as per Government of India norms. Candidates claiming age relaxation should submit their self attested copy of relevant certificate issued by competent authority as per Govt. of India norms along with the application form, in support of their claim. 8. Eligibility of candidate with regard to age, qualification & experience shall be calculated/ considered with reference to last date of the online application, as per criteria specified in the advertisement. 9. The Persons with Disabilities (PWD) with minimum 40% disability under the specified categories as per Government of India rules are eligible to apply under the reservation category for the advertised post at serial no. 9. 10. For availing the benefit of OBC category, the applicants may enclose with the applications form, OBC (Non Creamy Layer) certificate issued by the Competent Authority not earlier than one year prior to the last date for receipt of applications. The OBC Certificate should be in the proforma prescribed by the Government of India. 11. For all the advertised positions preference will be given to candidates with experience in reputed educational institutes or Centrally Funded Technical Institutes (CFTIs), having knowledge of computer applications with good working knowledge of English language. 12. The institute will have the right to relax any of the conditions such as minimum qualification, experience, age, etc., in deserving case for the advertised post. 13. For the outstanding applicants having work experience in IIT system, relaxation in the eligibility criteria may be considered. 14. Any subsequent amendments/modifications etc. on this matter will be notified in the institute website only which may be referred to by the interested candidates regularly. Issuance of amendments/modifications in the newspapers is not obligatory on the part of the institute. 15. Institute reserves the right to not to fill up / cancel the post advertised without assigning any reason. 16. Institute may offer lower position than advertised or on contract in case selection committee recommends. 17. Candidature of applicant shall be subjected to verification of testimonials at any subsequent stage. 18. Candidates may ensure that they fill in the correct information; Candidates who furnish false information are liable to be disqualified at any stage of recruitment. 19. Only screened-in applicants will be called for interview. No interim correspondence whatsoever will be entertained from candidates regarding conduct and result of interview and reasons for not being called for interview. 20. Shortlisted candidates for written test / interview and finally selected candidates only will be informed individually via e-mail correspondence on their registered e-mail. 21. The Institute shall have the right to restrict the number of the candidates to be called for interview on the basis of qualifications and experience higher than the minimum prescribed or any other criteria that it may deem fit. 22. No TA/DA shall be paid to the candidates for attending the written test / interview. 23. The Institute reserves the right to increase/decrease the number of vacancies advertised.